DD texted to see if I wanted to go to bookclub together, and I texted back to say I was actually at the college coming off of my 6th straight meeting. Before I hit up bookclub at Lucky's Steakhouse, I had to have dinner with a Psych department faculty candidate at Capital Prime another steakhouse clear on the other side of town. That's two too many steakhouses for someone who doesn't even eat steak. Anyway. By the time I got to Lucky's discussions were underway, but there were so many lovely people I knew and I got to stop by the different tables for hellos and hugs. But even the lovely people looked at me funny when I said I'd already had dinner so I ordered a giant dessert to show I do eat. I am mature and self assured. 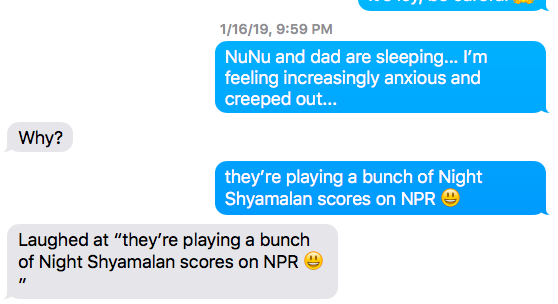 By the time I got home Nu and the puppies were asleep (school night) as was Big A (he's working tonight) and I sat there in the living room, with the radio on, catching up on email and beginning to feel queasy and kinda anxious. And then I figured it out and texted our college boy who was awake (college life). It was M. Night Shyamalan night on WKAR's Michigan Matinee.